Tonight I want to. To hold 100 balloons and fly away. I want to see the sunrise before anyone else. To spot it from my cozy spot up, up, up -way up high. Smiling at the moment we share alone - just me and the sun. I want to be untamed. The good kind. Wild and in my natural state, the way God intended me to be. I want to paint in red regardless of the color palette. Leaving behind the thoughts of being too much or too little. I want to walk up to the fire and confront it. Face to face. So close that my eyes reflect the flame and the smell of smoke lingers in my hair. I want to burn without burning out. I'd like to drink coffee with the mystics and smile. Laugh at their mysteries knowing that I know One who knows all and sees all. Look them in their eyes and tell them to keep looking, for they haven't found it yet. I want to send postcards from the unknown. Skipping over five-point stars high in a dreamy sky with effortless motion. I want to hold His hand and hear Him call me 'darling' while He shows me what 'on earth as it is in heaven' means. I want to go further than I have been told I could. I want to laugh harder than is lady-like. I want to dream something so magnificent I will never be bored. I want to scare hell to death. 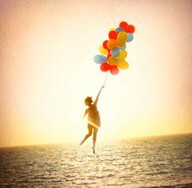 I want to hold 100 balloons and fly away.